Building a sculpture for a ceiling installation is unlike any other installation. With safety being a high priority, I had to make sure the ceiling mounts were very strong and all the components had a sound design. I built a replica of the ceiling, with all the mounting points, in my shop. The replica ceiling was built 4 feet lower to aid the construction. As can be seen in the photos, all the tracks have guardrails on both sides of the track to provide full ball containment. Since the sculpture was so large, I built it in three individual sections, each being installed at different times. Regardless of what went into the construction, the final results speak for themselves. The sculpture runs constantly during business hours. The speed of the lift can be changed from zero to about 7 balls per minute for each section. The sculpture runs best at around 3.5 balls per minute. Any faster and all the motion creates sensory overload! The ceiling mounted rolling ball sculpture, Swirly, Speed, and Squiggle, entertains patients as they recline back and look above. When viewed from below, the abstract shapes of the "swirly" section come to life. 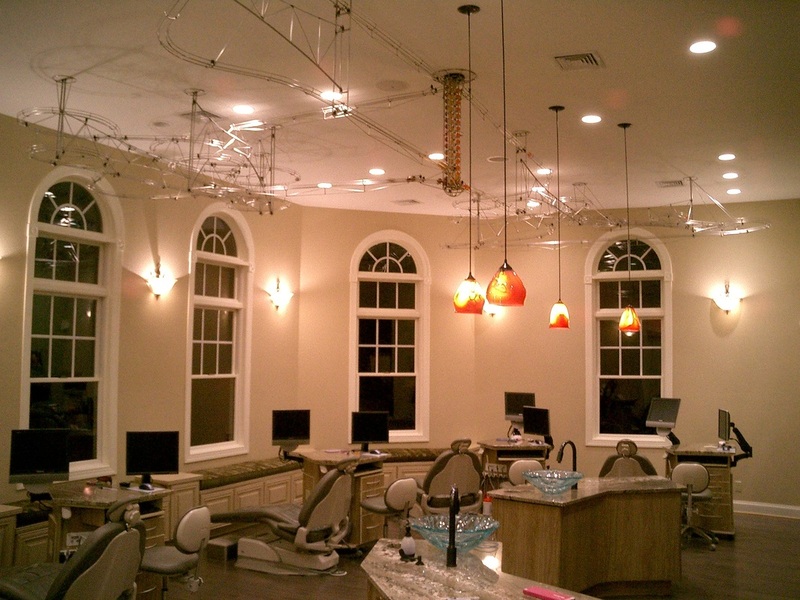 One challenge of a ceiling installation is the limited available vertical drop. I had a total of 30 inches to work with vertically. The ball queue at the bottom took up three inches, and the top unloading ramp took two inches. This left me with 25 inches of total vertical drop to work with. Most rolling ball sculptures have steep drops and fast track elements that reduce the vertical height very quickly. I couldn't afford to loose that much potential energy, so I had to conserve vertical displacement as much as possible. Swirly, for instance, has over 103 feet of track. Since I had to ensure the balls would never get stuck along the track, I had to always keep the track pointing downhill. 25 inches of displacement over 103 feet of track produced a constant slope of -0.02, or a 2% grade. Accuracy was very important. Measure twice, weld once! When designing and building this sculpture, as with all my sculptures, artistic composition was always in the back of my mind. I try to create an interesting composition by using contrast and balance. A good example is with Squiggle. When you look at squiggle from below, the organic shapes of the track stand out against the straight lines of the supports. When I needed the ball to cross back under the whole sculpture, I used a straight track section supported by an integrated truss. This causes the intersecting track to blend into the background, rather than standing out. When you look at the same sculpture from the front, you can see the straight track section located below the whole sculpture. This helps to balance the composition of the sculpture from the front view, while completing the ball's motion as it travels back to the lift. 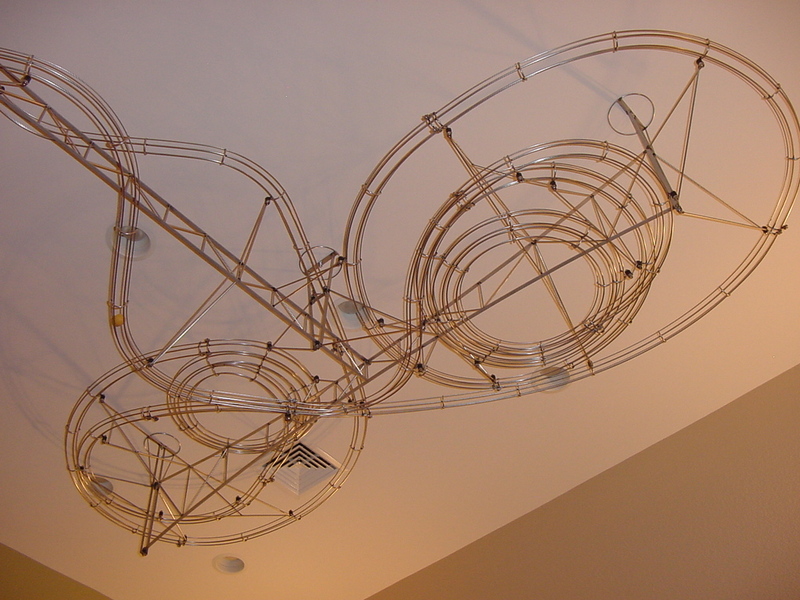 "Swirly, Speed, and Squiggle" definitely rounds out the whole theme of Orthodontic Arts, where there is much more to see than just this sculpture. The Sculpture is definitely a one-of-a-kind and well worth the trip to see it in person. Sit back and relax while enjoying the show... Trust me, you will be all smiles.